to give you the facts you need to determine whether this particular hiking vest deserves a place in your layering system. 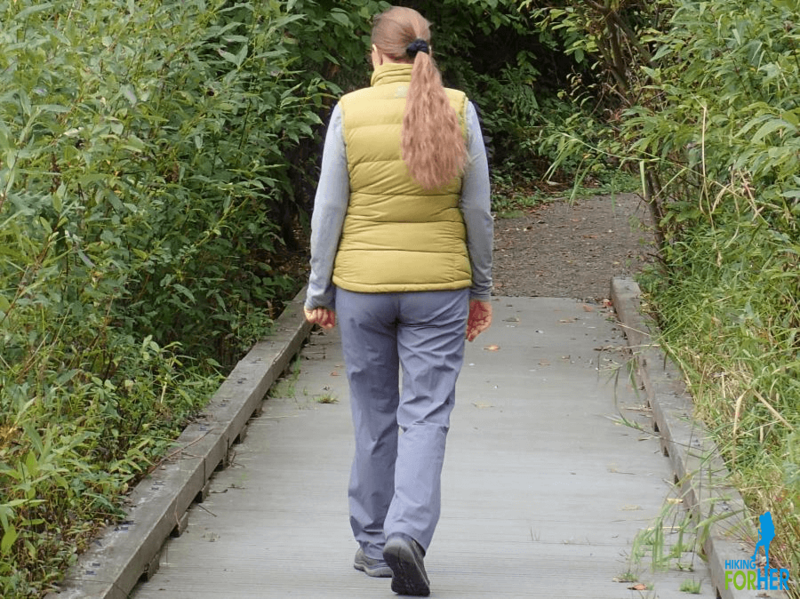 My Trail Co provided Hiking For Her with a women's down vest to test on the trail. 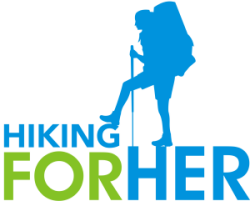 All of the comments, opinions and photos in this review belong to Hiking For Her. In addition, Hiking For Her is a My Trail Co affiliate. If you make a purchase through the links on this page, HFH will receive a small percentage of your purchase price. It's important to put some thought into selecting each of the pieces of your hiking layering system. If you're not familiar with the smart idea of using a hiking clothing layering system, read this first. You want your money to go as far as possible, so you can go as far as possible on the trail. 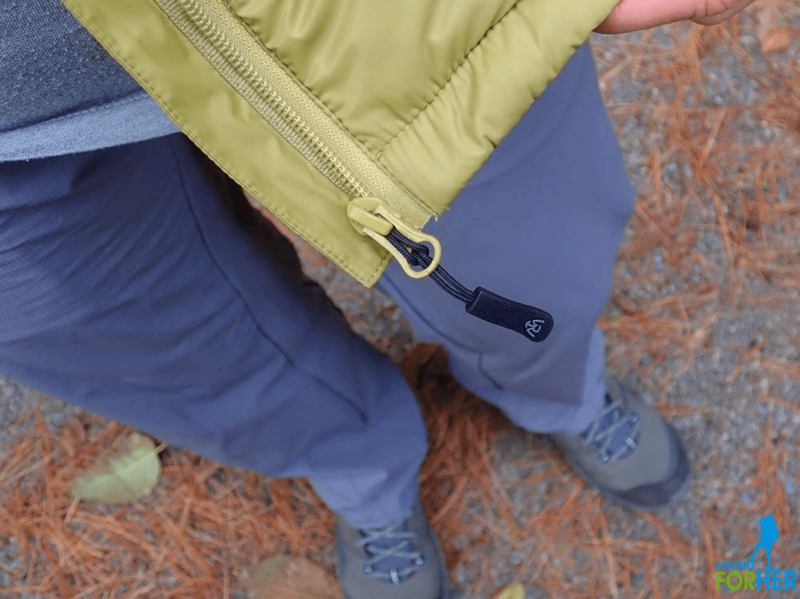 Choosing versatile pieces of clothing that coordinate and cooperate to keep you comfortable on a hike means you never have to run around at the last minute wondering what to wear hiking - it's already hanging in your gear locker! Okay, that sounds great in theory. What is this outdoor clothing designed to do for me? Which materials and fabrics are used in its construction? Is this clothing appropriate for my style of hiking? 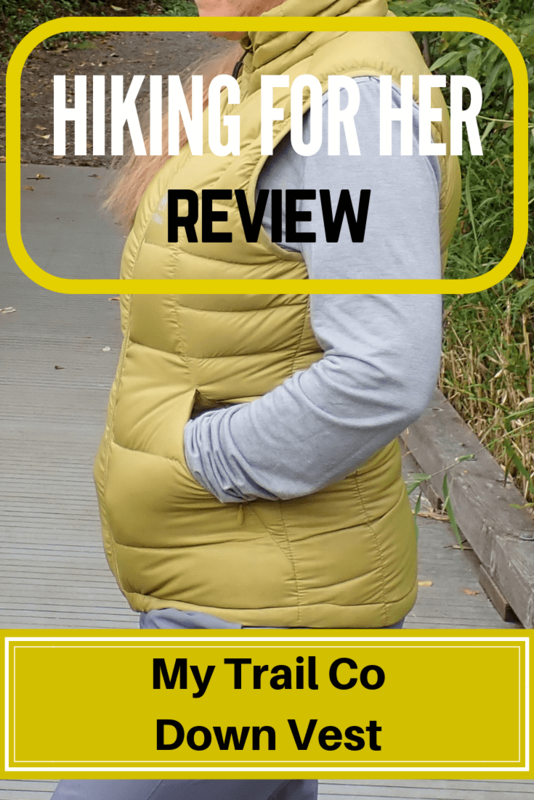 So let's ask, and then answer, these questions in this My Trail Co vest review. This vest ticks all the boxes! It felt roomy enough to allow me to bend and twist while taking my backpack on and off. But the vest was form fitting enough that I could pull my rain jacket, or a fleece hoodie, over it without feeling like I was trapped inside an overstuffed pillow. We're not building the space shuttle here. But let's look carefully at the construction and materials anyway! First, what's on the inside? 700-fill duck down, weighing 95 grams. Okay... so what does that mean for you? 700 fill refers to how "fluffy" the down is when you measure and compare it under controlled conditions (the technical term is "loft"). FYI: Fill numbers run between 900+ (really warm but expensive) to the low end of quality, around 400. Ducks and geese have figured out that trapping air against a warm body can be efficient and nearly weightless, and humans have borrowed the concept (and the down). 700 is a good number when you want to hike unencumbered by a jacket. humane treatment concerns focused on how the down was obtained. My Trail Co links to these responsible down standards to explain the source of its down. Nylon is a typical material to use for an outer layer of hiking clothing. It has useful properties such as durability and lightness, and can stop wind when layered with down, as in this vest. Pairing nylon with a down inner layer retains your body heat if the vest gets damp, too. On any vest you're considering, check the stitching and zipper quality. Are any feathers poking out of the seams? Does the stitching look like it will give you lots of seasons of zip/unzip/zip cycles? Is there a handy zipper pull you can grasp while wearing gloves? 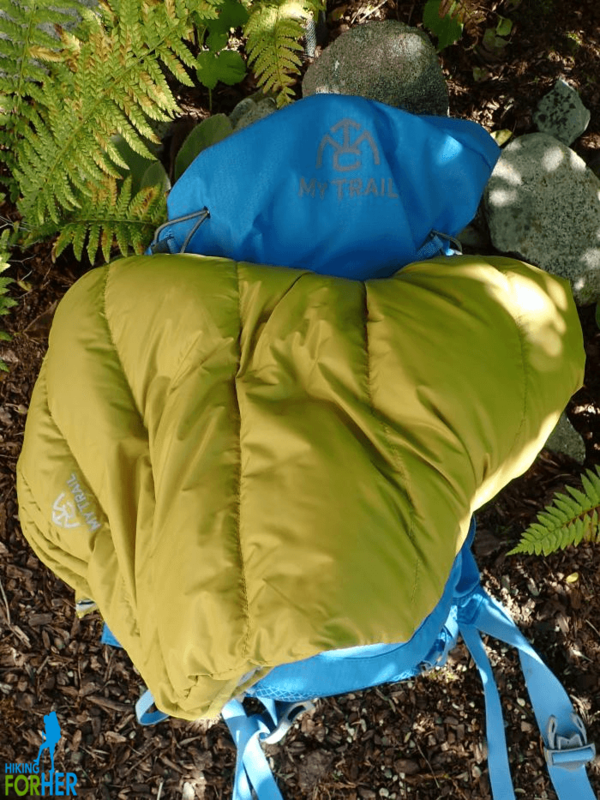 Depending on which device you are using to read this My Trail Co vest review, it will look bright yellow (but not mustard yellow), or a greenish yellow. Out in natural light, I found it to be somewhere in between, and a nice change from what's currently on the market in women's hiking vests. 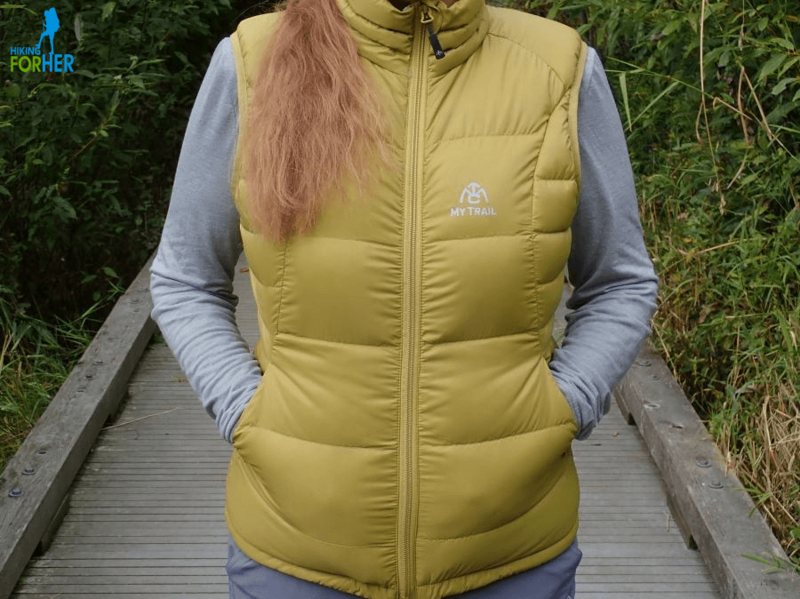 Women hikers tend to run a bit colder than their male hiking companions, so the first thing I recommend to a new female hiker is a vest. But sometimes a woman balks at having to carry "extra" clothing. Basically, it weighs nothing on your body. It buys you a lot of comfort and a welcome margin of safety on chilly trails (700 fill power) without costing you a lot in weight. This is where your personal preferences come to the forefront. Do you hike on moderately wide, well marked trails where you're not required to make large motions and sometimes tricky maneuvers around obstacles? Or do you go cross country or off trail, through brush and scrub? 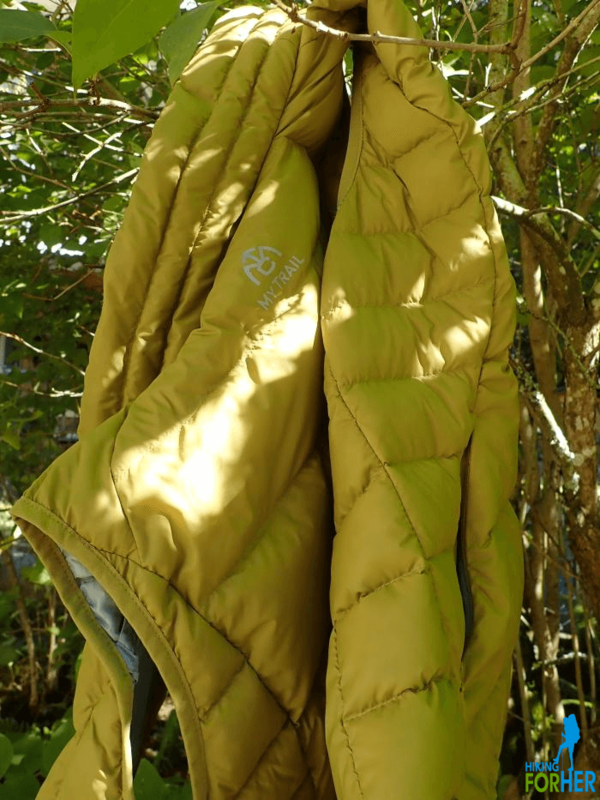 Do you like your hiking clothing roomy and able to accommodate at least one layer below, and another above it? Or do you like form fitting clothing that doesn't catch or snag on bushes or rocks? My impression of this My Trail Co vest is that it can fit into your hiking wardrobe as a form fitting vest if you order your regular size. That's what you're viewing in the photos in this review. But the vest will accommodate a layer or two beneath it, if you order up one size. Yup, a plump down vest definitely adds a bit of bulk to your profile. As a hiker, I've made peace with it in exchange for the comfort and safety of down. And for the record, this is one of the more streamlined vests I've seen. I liked the microfleece lining in the pockets, such a nice touch for cold hands. Did I wish for an internal pocket to stow my gloves and headband? Yes, but I appreciate how weight conscious My Trail Co is about their gear. The vest rolled up in a snug little ball inside my backpack, but came out ready to go after a brief fluffing. The vest rode along in the stretchy nylon outer pocket until I needed it. My Trail Co gear in Hiking For Her's favorite colors! Be sure to read the HFH backpack review (use the link at the top of the page). And there's something so comforting about pulling on a down vest and feeling your body heat radiate back to your skin. Especially on a chilly, breezy trail. Or as a pillow for your weary head, on a backpacking trip! So if you're looking for a layering piece for your clothing system, this vest definitely has merit. And wouldn't it make an excellent (and thoughtful) gift for a trail buddy? Hiking vest = hiking happiness on chilly trails.